Most of our second day at Michigan's Adventure was spent in the water park, Wild Water Adventure. 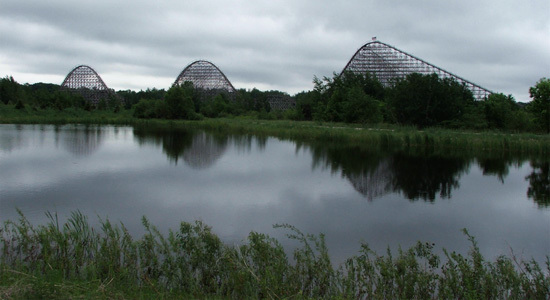 A good collection of water rides, lazy river and wave pools; the largest water park in Michigan. Sunny skies and a nice breeze made for a perfect day. Our biggest surprise of the day came while we were in the large wave pool. The lifeguard blew his whistle, stopped the waves and dove into the pool near us. I could see a body on the bottom of the pool that he was after. It was somewhat close to me and I wasn't sure if I should try to help. The lifeguard quickly pulled the body to the surface and we could see that it was just a dummy. Then we saw that it was a test by one of the supervisors standing nearby. Good times. We were also able to get our first ride on Thunderhawk. So we were able to ride all seven coasters in the park. We rode Wolverine Wildcat and Shivering Timbers so many times that we lost count. Sarah and I had the final train of the day on Thunderhawk all to ourselves. Front row. Love it. Our second day also had small crowds and rides were mostly walk-on. Only Thunderhawk had a line and ran with a full-load. Another great day of fun and sun. Check out all my pictures from Michigan's Adventure.